To find this url, log on to TripIt, click on your name in the upper right and select "settings" from the popup menu. On the "Account Settings" page, click on "Publish your TripIt data" to go to the "Publishing your TripIt data" page. Then click on the "Subscribe" link next to "Calendar Feed" to popup the calendar dialog, and then click on "Subscribe to calendar feed." Copy the url starting with "webcal://...." This is your TripIt "calendar feed url." 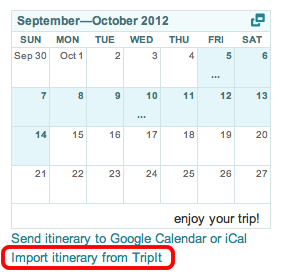 Go back to Planapple and paste this url back into the input field on the "Import from TripIt" dialog above. In a few moments all of your flight information should begin showing up in your Planapple trip. 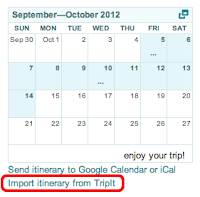 There's no need to refresh the page, Planapple should import all of the TripIt items scheduled during your trip start and end dates immediately. You only need to perform the steps above to import your TripIt calendar feed once. Once you have it set, Planapple will automatically check with TripIt to see if any items on your TripIt itinerary occur during any of your Planapple trips. When it finds matching items, it will will import them, and keep track of them to automatically sync any changes you make on TripIt back into your Planapple trips. You only need to do this once, and all of your future Planapple trips will automatically be synced with TripIt. We're pretty excited about this feature, and we hope it makes Planapple even more useful to you for organizing your trip plans. As always, click on the "Feedback" tab on the right to share with us any thoughts or questions you might have. We'd love to hear what you think.